Carmel High School is renowned throughout Hamilton County and the entire state of Indiana for its first-class high school sports program. With a student body of about 4,000, Carmel competes in the largest IHSAA division categories of 5A and 4A. During the fall, Carmel offers football, tennis, cross country, soccer, volleyball, golf, and competitive cheerleading. Despite the chilly weather, the heat of competition is high during the winter months when Carmel basketball, volleyball, wrestling, cheerleading, and swimming and diving teams are competing in full force. And as the school year winds down in the springtime, Carmel athletes are vying for titles in baseball, softball, golf, tennis, and track and field. Carmel High School sports teams have won numerous state championships. Women's basketball, and women's swimming were crowned champions in 2008! The school's facilities are among the best in the state. 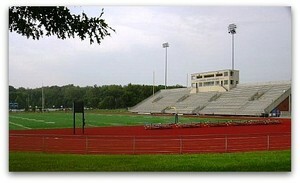 In 1991, Carmel Stadium opened as the home field of the school's football, and track and field teams. Basketball and volleyball teams play at the newly-renovated Eric Clark Activity Center. The indoor natatorium seats more than 600 and is often host to the IHSAA sectional swimming championships. Other facilities include Murray Stadium for the soccer teams and Hartman and O´Malia Fields for baseball and softball. * Nickname: "Greyhounds" or "Lady Hounds"
Onward to victory! Rah! Rah!